Inside the Arthur F. and Patricia Ryan Center for Business Studies, the refurbished façade of Dore Hall is clearly visible. 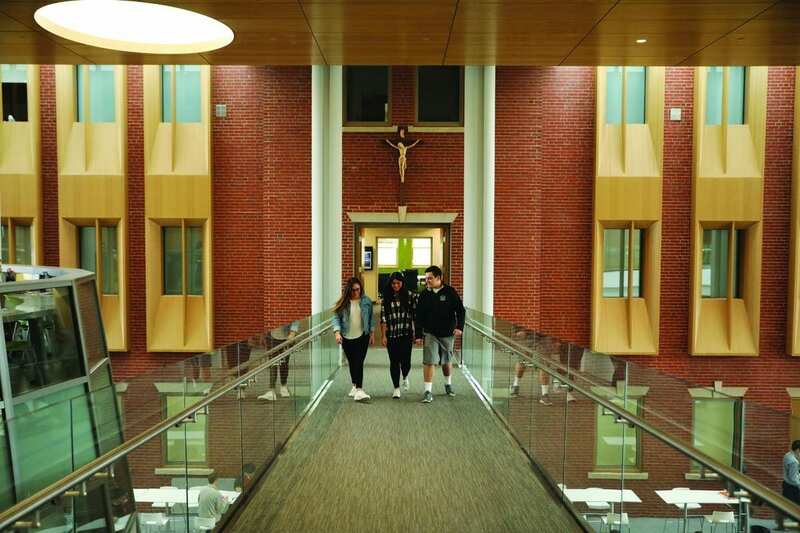 Through Our Moment: The Next Century Campaign for Providence College, the College increased its open space, including areas for recreational use, by about 5,000 square feet. 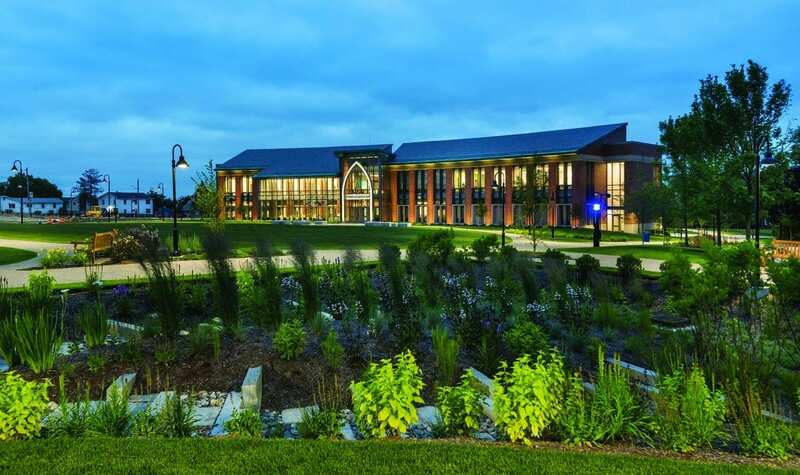 At the same time, the College constructed new buildings and additions on about 53,000 square feet of land. The additional green space came about because much of the major construction took place on parking lots, as with the Arthur F. and Patricia Ryan Center for Business Studies and the Ruane Center for the Humanities. The Anderson Stadium project, which includes Chapey Field for soccer and lacrosse, retained recreational and open space while replacing surface parking with a parking garage and expanding pedestrian walkways. When the driveway behind Harkins Hall was eliminated, the size of the Slavin Center lawn increased. Visitors who enter the Ryan Center can see the refurbished façade of Dore Hall, the former residence hall that now houses faculty offices, meeting rooms, and a café. More than 90 percent of the material removed from Dore — metals, wood, and bricks — was recycled. Reconstructed wood — scrap wood that was shredded, steamed, compressed, and glued back together — was used behind the wood veneer panels throughout the building. This is scrap wood that was shredded, steamed, compressed, and glued back together. Even the curbs from Huxley Avenue were repurposed — dug up and re-used in campus parking lots and as sculptures in a rain garden. The curbstones for Huxley Avenue were saved and repurposed as sculptures in bioswales, or rain gardens, shown here near the Arthur F. and Patricia Ryan Center for Business Studies.